Do you need exquisite decoration for your Bully? 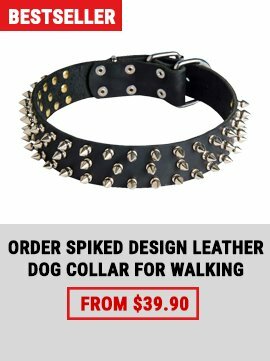 Try this excellent walking leather collar vastly decorated with spikes. Nice comfortable accessory! 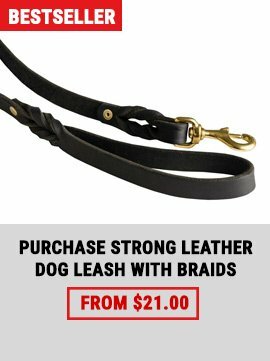 Are you looking for spiked collar for your American Bulldog? Comfort for your pet. The collar is crafted of genuine leather material that makes it soft and gentle for wearing. It prevents rubbing and irritation. There are no cutting edges that can wear into the skin when your dog pulls on the leash - they are carefully smoothed. 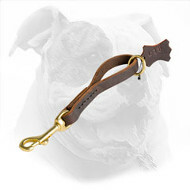 Also, leather material offers good air circulation so your dog won't be exhausted after long wearing. Reliable usage. Genuine leather is very strong and long-servicing material. 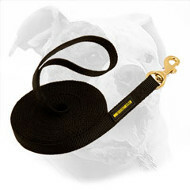 It can withstand overloads well and it won't break the moment your dog pulls the leash. Rust and corrosion resistant metal parts have increased strength too so they allow confident control over the dog during his/her walking. 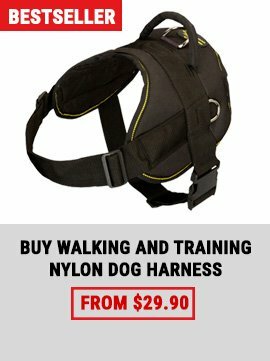 Confidence in your dog's safety. 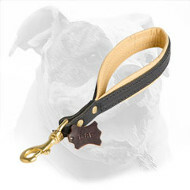 The collar is manufactured of friendly for the dog's health materials so it causes no allergies or poisoning. It allows the owner to have good control over the dog not accompanied with pain or discomfort for the canine itself. Super fashionable accessory. Vast spiked decoration is the best for American Bulldog - this breed is usually depicted in spiked collar for a reason. Get it right now at a very attractive price! It will be pleasing your eyes for years!